People ask us regularly, ‘Why is there a black line at the gum line below my crown?’ While this is perceived to be an esthetic problem, it does not necessarily indicate a serious issue with your crown or mean that your crown needs replacing because it is not functioning properly. However, if the black line is visible on a front tooth, the esthetic problem might be unsightly enough to consider having the crown replaced using a different material and better construction so that it will have a more natural appearance. Several potential factors can contribute to the appearance of that black ‘line’ at the base of a crown, some being more common than others. The first factor is the material of which the crown is made. Traditional crowns are made up of either gold or porcelain fused to metal (PFMs). PFM restorations have a porcelain overlay to match natural tooth structure over a metal base, usually an alloy of either precious or semi-precious materials. In the anterior of the mouth crown preparations are usually done slightly under the gum-line in order to hide the margin of the crown. If this margin is exposed a dark line will appear. Sometimes people see this dark area and mistake it for decay, when in reality it is the metal showing near the gum line. The second and factor is recession of the gum, which is fairly common. 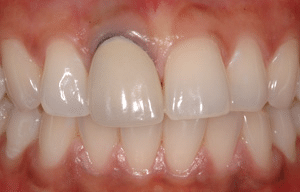 Recession can affect both traditional PFM restorations and all-porcelain restorations that have no metal whatsoever. Recession can be caused by over-brushing and/or vigorous brushing of the teeth and gums, tooth grinding, periodontal disease, and shifting or movement of the teeth. It is even possible that you are not seeing metal but the natural tooth structure below a crown, and that surface can appear dark if you had a root canal at the time of receiving your crown because of trauma to the natural tooth during that process. The third factor and less common is decay. Patients with crowns or veneers are sometimes under the false impression that just because a tooth has a crown or veneer it is impervious to decay. While crowns serve as added protection to the natural tooth structure but are susceptible to decay especially around the margins. It is important to see your dentist on a regular basis to ensure that your crown is maintaining its integrity and functioning properly to protect your natural tooth beneath the crown. 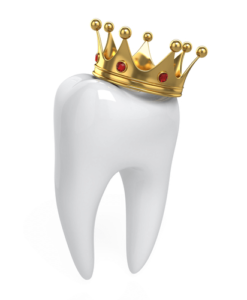 We can make adjustments and ensure that your crown stays secure here at New Town Dentistry. We found some more information about crowns and the materials crowns are made of at WebMD.com. Talk to Dr. Wolfe about your crowns and he will inform you about the procedure and materials used in the crowns he prefers to use on his patients. He will also advise on when a crown is necessary and potentially offer some alternative methods to repair a cracked tooth or tooth in need of new fillings. Take care of your crowns and teeth by flossing regularly, even around the crowns. Brush your teeth and gums gently, preferably using a soft bristled or electric toothbrush. We can recommend a product most suitable for you. Do not panic if you see a black line at the gum below your crown – typically it is not a big concern. If the appearance of an old crown on a front tooth is unsightly, we can change it to improve your smile. When you visit our office we will carefully inspect your crowns and talk to you about receding gum or periodontal issues you could have, offering advice to treat or avoid those issues. PreviousPrevious post:Prevent Bleeding Gums & Bad BreathNextNext post:Flossing 101 | Is there a right and wrong way to floss?